As a little girl I used to spend lots of time at my grandparents’ place. Among all the beautiful memories I’ve kept from that time there’s my grandmothers’cooking. Even now, when I close my eyes, I still can smell and taste all the delicious meals she used to cook for us. Like most of kids, I loved when my grandmother made sweet dinners...fruit soup with homemade noodles, cheese blintzes with homemade vanilla cheese, potato pancakes sprinkled with sugar, or pierogi, delicious dumplings filled with vanilla cheese or wild blueberries picked up in forest by my grandparents. No one else’s pierogi have been as delicious as the ones made by her. The secret of her pierogi is simplicity. My grandmother’s dumplings have always been made with only three ingredients, flour, boiling water, wild blueberries...well, maybe also a pinch of salt and that’s all. There’s no egg or olive oil, so often used in other recipes, in her pierogi dough. Such dough is certainly not easy to work with, it takes long to knead it, it’s not easy to roll, and it gets dry quickly (that’s why it’s important to keep it covered with damp cloth) . The result is worth the effort though. The dough made this way comes out incredibly thin, almost transparent, but firm at the same time. This way you can fill your dumplings with plenty of blueberries without danger of destroying it. Served with breadcrumbs and butter and sprinkled with a little bit of sugar such pierogi taste absolutely awesome!!! 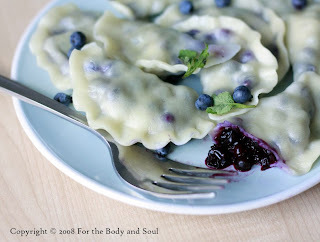 In Poland blueberry pierogi are usually served with sour cream and a little bit of sugar. As I've mentioned, I prefer to eat my pierogi with butter and bread crumbs, especially if I have them as a main meal. If you prefer lighter version or want to serve your pierogi for dessert rather than main meal, cream would be a better choice. I suspect this pierogi would taste delcious with vanilla yoghurt as well. I don’t give the exact proportions of water here as it depends on the flour you use. The flour I use in Canada, takes much more water than the Polish one. Start with 150 ml, and then add as much water as needed to make firm and elastic dough. The water you’re adding should be hot, wait a little before you continue kneading the dough, to not to burn yourself. 1. Sift the flour and salt into a large bowl. Make a whole in the center and pour boiling water into it. Stir the mixture together with a fork, gradually incorporating the flour into the whole. 2. Transfer the dough onto a lightly floured surface and knead until smooth and elastic. Add more water if needed. Wait a little with the kneading after each addition of water, to not to burn yourself. 3. Wrap the dough in plastic wrap or cover with a damp dishtowel and let it rest for at least half an hour at room temperature. 4. Take a workable portion of dough and roll out very thin on a floured surface. 5. Using a drinking glass or round cookie cutter, cut circles (approximately 3 inches in diameter) Roll out each circle a little bit more or stretch it with your fingers; the dough should be very thin. 6. Spoon some blueberries into the center of each circle. Fold each circle in half around filling to form a semicircle, and firmly press edges together with your fingers. The edges should be free of filling. 7. Transfer the pierogi to a lightly floured baking sheet. Cover with a dishtowel. 8. Continue to fill and form pierogi, until all the dough has been used. 9. Cook or freeze uncooked for later use. Bring a large pot of salted water to boil. Gently place a few pierogi in boiling water (do not cook more than a few pierogi at a time). Boil, stirring occasionally with a wooden spoon to keep them from sticking to the bottom. When the pierogi are floating on the surface let them cook 2 minutes more. Be careful to not to overcook them. Remove ready pierogi with a slotted spun or skimmer. Serve with cream or melted butter and bread crumbs topping (see recipe below). Sprinkle with sugar. Place uncooked pierogi on a lightly floured cookie sheet, make sure the pierogi are not touching each other. Place the dish in the freezer.When the pierogi start to freeze and are not sticky anymore, you can transfer them to plastic bag. 1. Place the bread crumbs into a pan. Cook on a low heat stirring from time to time until the crumbs turn golden brown. Be careful to not to burn them. 3. Pour the bread crumbs and butter over the pierogi. hello, what kind of sugar did you use? do you recommened powdered sugar? Personally, I like to use large grain sugar - it gives a little bit of crunchiness to the topping, but feel free to use whatever you like most. 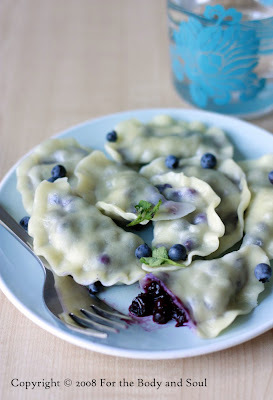 I really have to make blueberry pierogies this summer...there so good. I grew up eating yummy blueberry pierogi in Chicago. Now I live in Alaska and there are soooo many blueberries here to pick. I am excited to try your recipe, thanks for posting it! These look so delicious! I pick 65 lbs. of blueberries every summer. I never thought to use them in my homemade pierogi. Thank you for sharing, not just the recipe but such a sweet grandparent story. It brought me back to my childhood days.